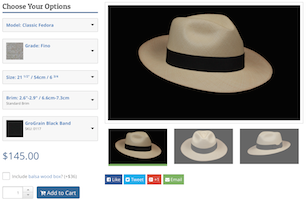 Montecristi hats are known for their tight weave pattern, so tight it can even hold water. If you were to turn it upside down and fill the crown up with water it would take a long time to drain out! No matter how fine the straw is or what grade of Montecristi it is, this hat has a very airtight weave pattern. Yet it is still remarkably great in the sun! The light coloration reflects light and stays cool, and because of the lightweight feel of the hat (120 grams on average) it's as though you didn't even have a hat on, it's that lightweight! This Havana Panama hat has the classic C crown style, known also as a Fedora C crown or teardrop crown, and blocked in standard oval. The standard crown height of this Havana model is 3.9" - 4.1" measuring from the brim to the top point of the crown in the front of the hat. The back of the crown is a little lower then the front giving this hat a leveler appearance from a side profile, the back measures between 3.7" - 3.9" and 4.3" - 4.4" on the side of the hat. Stingy Brim: Almost the smallest brim we can make and still be called a brim! Snap brim on the front causing the brim to tip downward slightly and upward in the back just a little. Not a lot of shade protection, primarily it is a style thing! Some people just look great in short brims! This is a very unique brim for its rather small size. Send us your question about this Montecristi Sub Fino Havana hat, and we will respond to you as soon as possible. What day of the week was it yesterday?